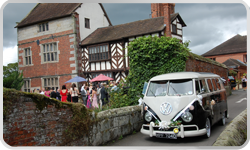 If you are looking for a wedding car that offers fun, style and something a little different, then you have found it. Arrive in style in one of our superb retro VW campervans. Poshpampacampa car hire company. Our campers are unique and one of a kind. Each one is different with its own character and unique personality. Our campers come with all the trimmings to make your big extra special. We can supply a champagne hamper for your journey with ribbon decorations, we can also dress Beatrice with colour co-ordinated ribbons and bows to match your particular colour scheme, we can also provide fresh flowers. When it comes to the big wedding day, this girl is gonna blow them away. If you would like to view any vehicle before booking, feel free to contact us here to make an appointment and view the high quality vehicles available. 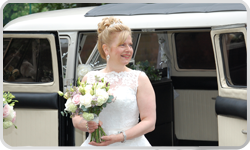 Bluebell our 1972 VW bay campervan has become very popular for weddings. Either on her own or with her sisters, adding a touch of style and elegance to your big day. By hiring both vans,the bride,bridesmaids,groomsmen and ushers can arrive in style,with both campers dressed elegantly in ribbons,bows and flowers. After the ceremony you don't have to say goodbye,our campers stay with you providing a fabulous backdrop for your photographs. We can if you like, take you and your new partner on a short drive. A chance for a few quiet moments together with glass of sparkling champagne, before greeting your guests at the reception. But don't let the fun end there !! Once the reception is over,simply pack your bags in the back of Bluebell and head off on your new adventure together. Whether it be countryside or coastline,hills or dales its a perfect way to start your married life,a fabulous experience and a wonderful story to tell,time and time again. Here at Poshpampacampa we understand that no two weddings are alike and we want your day to be as individual as you are. It is your special day and we strive to exceed your expectations,we offer a first class wedding service which is bespoke and tailored to you. Our packages include chauffeur driven to ceremony and reception including ample time for photographs. Our camper,Bluebell,left with you for your honeymoon for up to 6/7 days (depending on availability). A champagne hamper containing a selection of cheese and biscuits,chocolates and/or strawberries. We can redress the camper with "just married" sign and tin cans if required.